The Boston Bruins have officially hit rock bottom. Wednesday night’s loss against the Edmonton Oilers was the latest hole blown through Boston’s rapidly sinking ship. Claude Julien saw his team fight back from a 3-1 second-period deficit only to suffer a shootout loss against the Western Conference cellar dwellers. The loss was Boston’s sixth is seven games so far this month. Defensive miscues and complacency have possessed the Bruins lately after an 8-1-3 record gave fans reason to be optimistic heading into the stretch run. January optimism has been replaced by February frustration only the MBTA could compete with. Boston finds themselves in a precarious position with only six games separating them from the trade deadline. They find themselves in the final playoff spot in the Eastern Conference with the Florida Panthers and resurgent Philadelphia Flyers not far behind. The Bruins front office, specifically general manager Peter Chiarelli, know that time is running out to upgrade their hockey club. The paramount concern, however, is the limited amount of resources they have to work with. According to NHLnumbers.com, Boston has just under $2 million in cap space as March 2 approaches ($1.787 million to be precise). A top-six forward and top-four defenseman are pressing needs for a team that saw Jarome Iginla leave for Colorado and Johnny Boychuk traded to Long Island over the summer. Will they look to add pieces and gear up for a playoff push? Is there a chance Boston will begin to shed their higher-priced assets? Does Chiarelli keep the club as is? These are questions that fans will demand an answer to in the coming days. If the Bruins consider themselves as buyers, the market for top-six forwards, specifically wingers, is thin. One of the most prevalent names that has been often mentioned in trade rumors this season is Buffalo’s Chris Stewart. 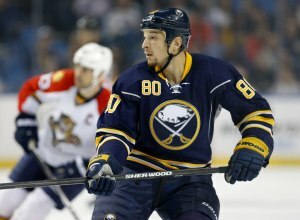 The Sabres will be keen to find a buyer for the 27-year-old as the club is in full-on tank mode after acquiring the injured Evander Kane from Winnipeg and dealing starting goaltender Jhonas Enroth to Dallas. Stewart’s $4.15 million cap hit this season, coupled with his disappointing on-ice performance, make him a less desirable option for Boston to pursue unless Chiarelli clears a significant contract off the books. Cam Atkinson of the Columbus Blue Jackets has been recently discussed in trade rumors as well. At 25, the Connecticut native is a restricted free agent with a modest $1.15 million cap hit this year. He has 13 goals and 24 points this season for a Columbus team that has been battered by injuries all year. Other names worth watching are former Bruin Jaromir Jagr, Martin Erat, and Arizona Coyotes center Antoine Vermette. The pool of available defensemen at this year’s deadline is led by Andrej Sekera. The 28-year-old is averaging close to 23 minutes of ice time per game this season while scoring 19 points from the blue line. His $2.75 million cap hit is affordable for several clubs that are inquiring about his services. Boston would have to engage in a bidding war for what may seem to be a rental player as Sekera will hit the open market this summer. Jeff Petry of the Edmonton Oilers is another candidate the Bruins may look at. The Michigan native is averaging over 21 minutes a night of ice time, scoring 15 points this season on Oil Country. His cap hit of slightly over $3 million makes him coveted by several teams scouring for help on defense, therefore Chiarelli would have to outbid his compatriots for Petry’s services as Edmonton looks to continue their rebuild. Zbynek Michalek, Chris Phillips, and Tim Gleason are other names that bear watching on Boston’s radar. If the Bruins want to reverse course and begin to “rebuild on the fly”, this year may be the time to do it. The only problem is that several of their big-name players are protected by no-trade/no-movement clauses, meaning the player would have to authorize any potential trade. Boston has several contracts they will look to unload, most notably the $6 million cap hit of Milan Lucic. The Vancouver native has one more year left on his contract after this season and could prove to be a valuable asset for a playoff team looking for a true power forward. His 31 points are fifth on the team while his 73 penalty minutes lead the Bruins. Chiarelli has quoted as saying he is reluctant to lose a piece of his “core”, but Lucic has been a shadow of the player that posted 30 goals and 121 PIMs in 2010-11. Boston should at least be fielding calls on what Lucic’s market value is. The recent call-up of 2012 first-rounder Malcolm Subban has sparked a firestorm of controversy of whether Boston is showcasing him in a potential deal. The younger brother of Montreal defenseman PK Subban has posted a 10-10-3 record with a 2.47 goals against and .920 save percentage with Providence (AHL) in 24 appearances this year. Some would argue the 21-year-old is Boston’s biggest asset, but it makes no sense to trade such a highly-touted prospect that has not played a minute in the NHL. Given Niklas Svedberg’s recent struggles in spot starts, Subban may be auditioning for the backup job behind Tuukka Rask next season instead of showcasing himself for a potential deal. A name that bears watching is pending unrestricted free agent Carl Soderberg. The Swedish center’s cap number is just over $1 million and is second in team scoring with 33 points. His chemistry with Chris Kelly and Loui Eriksson has made for one of the best third lines in the league, yet his consistent play will make it tough to sign Soderberg to a contract over the summer. “The Yeti” is expected to sign for top-six money ($3+ million) in the offseason and the Bruins will be reluctant to pay their third-line center with younger restricted free agents (Hamilton, Krug, Smith) waiting for new deals. Chiarelli would not clear enough money off the salary cap by trading Soderberg, but what is his market value. In a recent discussion with a source close to the Bruins, he stated “an AHL prospect and second-round pick” is what the Bruins are likely to get back. If trading Soderberg does not merit a player who can fill one of Boston’s pressing needs in return, it is a proposition that should not be considered. The third option for the Bruins is by keeping the roster as is. This is a risky ploy as Chiarelli and Julien will undoubtedly put their jobs on the line, given the current state of the team. Cap constraints are likely to force Boston into small acquisitions, but that will not sit well with fans of the club that are seeking an impact player who can help the team now. The GM and coach will be at the mercy of the roster they assembled, depending on the team to make a deep playoff run that Black and Gold faithful believe is not possible. Another early postseason exit could lead to sweeping changes in the front office, therefore Chiarelli will be pegged with the responsibility to ensure that does not happen or else he may not be around to build next year’s team. The Boston Bruins are caught in the crossfire of this season’s trade deadline. Do they try to add pieces, or begin to deal off their own? The only sure thing is that Chiarelli and the front office is under immense pressure to do something before the clock strikes 3pm on March 2.